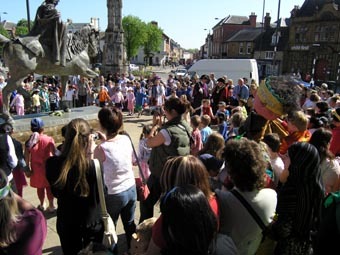 In 2007 it was decided to re-establish May Day celebrations in the town of Banbury after they were suppressed by the Puritans in 1589, a break of 418 years! Town Mayor Councillor John Donaldson commissioned Verna Wass to develop this project, in partnership with Tricia Campbell, his Secretary. "A" level students from Blessed George Napier School were involved in the organization, and children from four local primary schools: Hanwell Fields, Hillview, St. Leonards and St. Mary's took part in dance and design technology workshops led by Verna. As the Mayor's guests gathered in the Town Hall for breakfast, members of the Banbury Floral Art group were hard at work creating a colourful processional garland. At 10.00 a.m. the procession, lead by the civic party, garland bearers and accompanying musicians, wound its way up the High Street to the statue of the Fine Lady. There some of the youngest children from St. Mary's danced a circle dance to honour the Fine Lady before flowers were laid at her feet. The mayor takes it all in while local televison interviews a particpant. The procession then headed for St. Mary's Church where the bells were ringing in our honour, before proceeding down Parsons Street and across the Market Place to arrive at the bandstand. 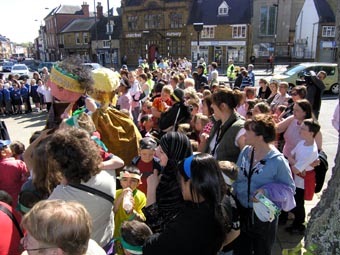 Here each school performed a specially rehearsed piece and spots were also laid on by Adderbury Morris and Bloxham Morris..
Did you know that by the1580s, during the reign of Elizabeth 1, May Day had become a big public festival in Banbury? Each year great tree trunks were decorated with garlands of flowers and erected as maypoles, around which the local community danced and made merry on Mayday, and during the May games and Whitsun ales which followed. So when did it all stop and why? In 1589 the Neithrop maypole hit the national headlines when it became the subject of a bitter row between local puritans and other townspeople. A group of puritans, apparently led by Anthony Cope M.P. Lord of the Manor of Hanwell, attempted to prevent the raising of the Neithrop Maypole by force.The revellers, supported by John Danvers, Sheriff of Oxfordshire, of Calthorpe House, vigorously resisted intent on their merrymaking, and a riot ensued. In the weeks that followed both Anthony Cope and John Danvers used their power and influence in Banbury to challenge the other’s position. Richard Wheatley, Constable of Banbury, wrote to William Long, Constable for Neithrop and Calthorpe instructing him to take down any maypoles in his area, and to suppress any celebrations around them. 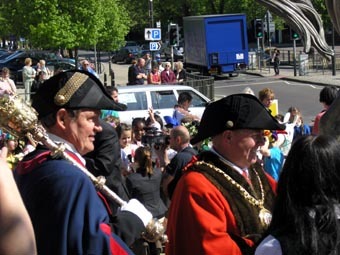 On May 20th 1589 John Danvers appealed to Queen Elizabeth’s Privy Council in London who agreed, in a reply sent on May 24th, that these traditional celebrations should be allowed on condition that they did not interfere with people going to Church on Sundays. Anthony Cope complained that John Danvers had insulted and threatened him, and Richard Wheatley, and the matter was finally taken to the Oxford Assize Court in July 1589, which found in favour of Anthony Cope and his puritan followers. Anthony Cope and his followers went on to destroy Banbury’s famous market crosses eleven years later in July 1600.
Letters and other documents about these events still exist today in the Acts of the Privy Council , and the Domestic State Papers. May 1st. 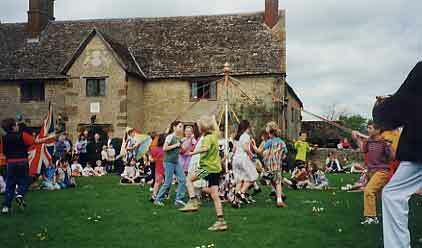 of 2000 fell on a bank holiday and was the occasion of a grand celebration at Sulgrave Manor in Northamptonshire. Children staff and parents, together with Verna Wass acting as a consultant both shared something of their modern celebrations and recreated aspects of the festivities as they would have been observed in the seventeenth century. 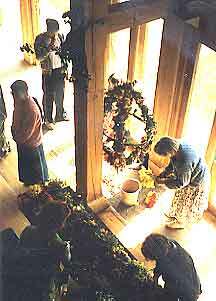 This celebration became a regular part of the programme at Sujgrave until 2005. Two maypoles had been set up; a modern one based on an old netball pole and beribboned with carpet tape, the other a reconstruction of a decorated pole from the seventeenth century which was of course ribbon free! 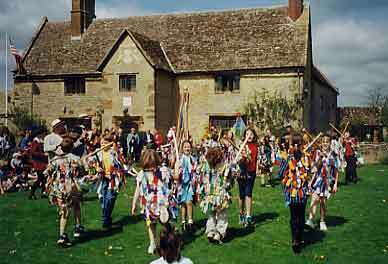 As well as dancing with ribbons the children also performed a collection of stick dances tentatively modelled on an early form of ceremonial dance called 'bedlam morris'. Finally everyone was invited to participate in a circle dance round the seventeenth century pattern pole to the tune of 'Newcastle'. What a day! The earliest body of historic evidence from the 16th century suggests a widespread celebration of spring through the medium of May Games. These could take place at any point during the late spring and featured events such as the raising of maypoles, decoration of houses with boughs of greenery and general merry making under the direction of a May king and queen who were sometimes identified with Robin Hood and Maid Marion. During the century an association grew up with morris dancing and hobby horses derived from courtly masques and civic pageants. Such events enjoyed a brief resurgence following the restoration of Charles II but by the end of the 17th century interest seemed to have waned and what celebrations there were seemed to linger on largely unrecorded in rural communities. However, the late 18th and early 19th centuries saw something of a revival with the custom now firmly tied to May 1st. In towns bands of milk maids and sweeps would tour often accompanied by a character carrying a leaf covered framework called a ‘Jack-in-the-Green’ . 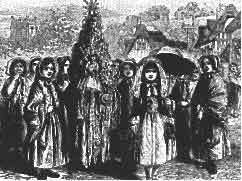 In the country Whitsun Ales, originally promoted by churches as money making ventures had largely supplanted the old style May day events but still in many locations bands of children would make garlands to carry round from house to house singing and appropriate song to beg for pennies. During the twentieth century Maypole dancing became an established feature in primary schools and was only abandoned in Greatworth in 1948 after the pole and ribbons were loaned to Helmdon School and were ruined by being left out in the rain! 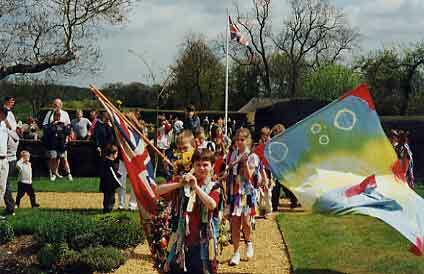 In 1988 children and staff from Greatworth Primary School revived May Day celebrations in the village. They were fortunate in being able to find local information about morris dancing in the 18th century, May garlands from the 19th century and Maypole dancing from the mid-20th century. Putting all these ingredients together has resulted in the school’s on-going festivities which are normally to be seen round the village on the morning of May 1st.